Critics today are calling Joel and Ethan Coen’s new straight-shooting, family-friendly True Grit remake a deviation from the brothers’ usual violent, irony-infused botched-crime thrillers and idiot comedies. But at least one part of the film will feel familiar to fans: Matt Damon’s spectacular, instantly iconic, old-timey mustache, which builds on the Coens’ proud tradition of decorating their characters with some of the finest nose curtains in all of cinema. 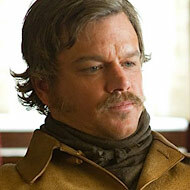 So where does Damon’s rank in the pantheon of other classic Coen ‘staches? We’ve ranked the top fifteen, measuring each using our patented ‘Stach-o-Meter (which grades on a scale of Zorro to Gene Shalit). (Note: For our purposes, we’ve made eligible any facial-hair styles that includes mustaches, even ones connected to beards.) Did we egregiously omit your favorite Coens mustache? You know where to complain!